Educational Qualification : Passed Intermediate/Graduation Exam and Certificate of Computers, 10 Year Work Experience as Anganwadi Worker and Knowledge of Hindi Language and Rajasthani Culture. 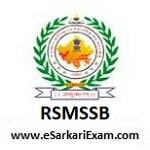 Eligible Candidates can Submit Application at the Official Website of RSMSSB latest by 3rd November 2018. Click on Recruitment of Anganwadi Supervisor Full Advertisement Link .